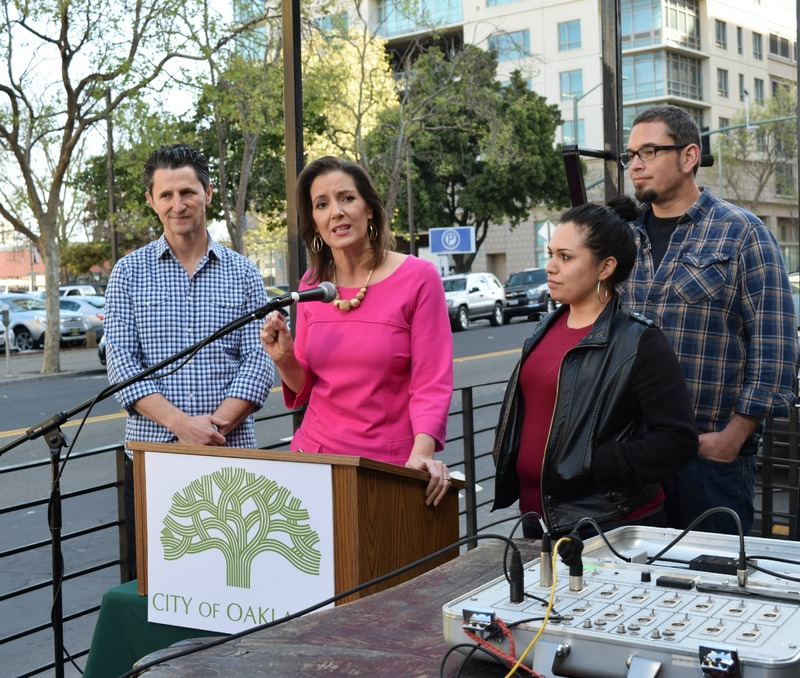 The press conference--and Schaaf’s desire to see you enjoying bottomless mimosas over the weekend--marked the beginning of the city’s public awareness campaign about Oakland’s new minimum wage. The $12.25 an hour wage went into effect Monday, making it the highest minimum in the state. The hike, up from $9 an hour, was the result of Measure FF, which won with an 82% majority last November. The 36% wage increase has been challenging for many restaurant owners, who are searching for solutions to offset the jump in payroll costs. Some higher-end restaurants, like Homestead and Bocanova, have jettisoned tipping entirely, adding an across the board service fee, while many other restaurants have simply raised prices. During the press conference, two restaurant owners--Chris Hillyard of Farley’s, and Sal Bednarz of Actual Cafe and Victory Burger--spoke about the challenges they’re facing. Hillyard said it was the largest cost increase they’ve had to deal with during the six years he’s been running the cafe, and they’ve had to raise their prices. How has the restaurant community been adjusting to the new wage? We had several restaurant leaders that supported this initiative, even from its earliest stages. Charlie Hallowell, the owner of Penrose, Boot and Shoe Service, and Pizzaiolo, was a very early supporter, recognizing that it’s good for everybody when people make a decent wage and they’re taken care of with things like sick leave. I have expressed a lot of support and empathy for our restaurant community, recognizing that this is a big change and it’s going to be a little painful. But I’m confident that in the final analysis, this will be a really great thing for Oakland and our restaurant community, because at the end of the day people will have more money in their pockets to eat out. How is your office helping restaurant owners with the transition? One thing we’ve been doing is trying to make sure everyone understands the new laws and they feel like all their questions can be answered, that they have support in knowing what the new expectations are. Secondly, we’re starting a public awareness campaign for Oakland consumers, to encourage them to understand why prices may be going up and ask them to put their money where their vote was. 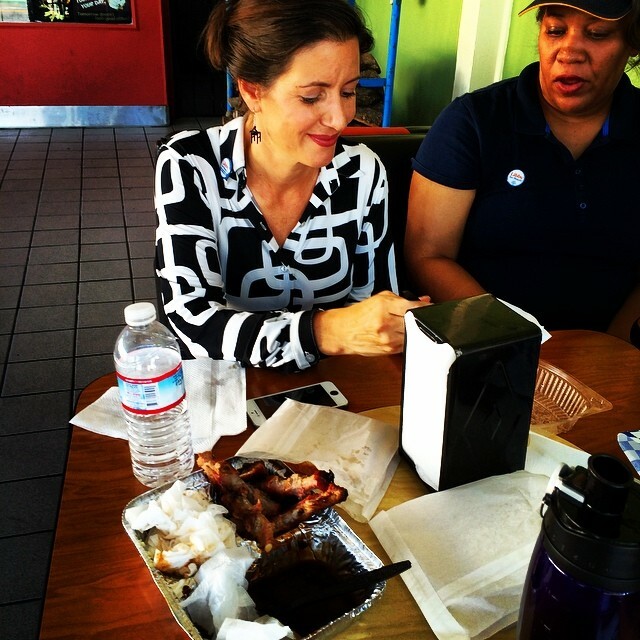 They have the opportunity to put that vote into action by supporting Oakland small businesses. Oakland restaurants are worth it. I mean, where else is there so much creativity and inventiveness in food than in Oakland? You’ve been vocal about bringing wealthy businesses into Oakland. How can the city balance new high-end restaurants catering to these new residents with traditional community standbys? Oakland has seen explosive growth in our restaurant scene. Last year alone, we saw more than 300 new restaurants and bars open up in Oakland. I have tried to focus on supporting neighborhood businesses. The East Bay Express just ran a story about their favorite Oakland restaurants, and they were very affordable, small, family-run restaurants that are off the beaten path--not in downtown, Jack London Square, Rockridge, Uptown, but in places like deep East Oakland, in the Bella Vista neighborhood. I mean Champa Garden, man, that place has a line out the door all the time and it’s not in a neighborhood known for restaurants--or even businesses. Oaklanders are adventurous and they love going off the beaten path, and part of what gives Oakland its charm is its authenticity. We’re not fancy or stuffy, we are creative and real. The cultural diversity in this city is also quite tasty. You've waited tables, how did that affect your opinion of the minimum wage increase? I have worked several hospitality industry jobs and know how difficult it is to rely on tips. Some nights you have good nights and some weeks you have bad weeks. And that insecurity is extremely difficult. I’m really pleased that Oakland’s seen a lot more service and hospitality jobs but now the people that work in them have a little more security, a little bit more assurance that they can support themselves and take a day off if they’re sick and they need to. Do you think $12.25 is enough? Would you like to see a higher minimum wage? I appreciate this as a great starting place for Oakland. 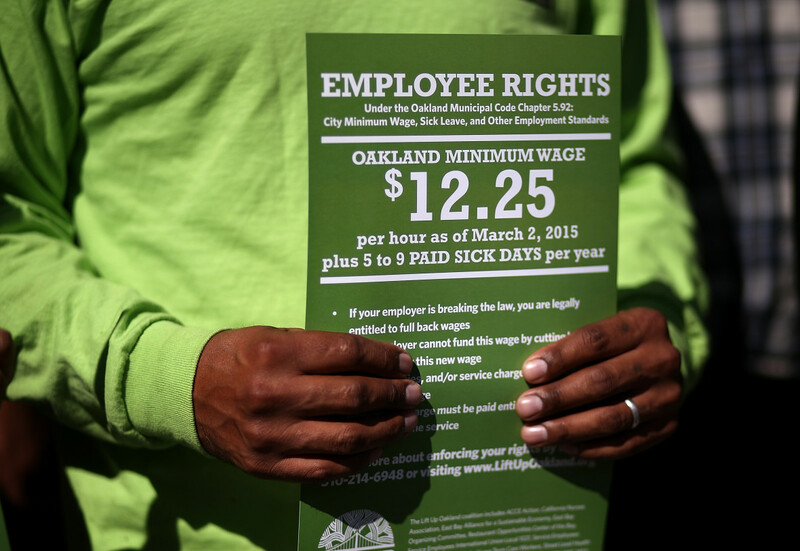 It is getting close to what we calculated the living wage is for Oakland. I would love to see the Bay Area become a little more affordable and the wages be better. I’d like to see movement on both ends of the spectrum because the cost of housing is a real issue throughout the Bay Area, including in Oakland. This was a big push for businesses to adjust to, but in a perfect world we will get our workers to a living wage, so that when you put in a full week’s work, you have the security that you can live and support a family. Having an economy where someone has to work two full-time jobs just to live in the city where they work is not good for people’s health, it’s not good for their families, it’s not good for our community. I think if we’re looking at a sustainable economy, we’ve got to have fair wages and we’ve got to have affordable housing. How are you planning to work on issues of food insecurity? I’m very pleased we’re going to be opening a new grocery store in West Oakland, which has long needed one. I’m excited about the zoning changes we recently made to make backyard farming easier. We’re seeing some creative expression, where locally grown food is for sale in small baskets at local corner stores. In the meantime, while we wait to get full service grocery stores put into every neighborhood that needs them, [there are] these basket options, food carts, farmers’ markets. Some schools even [have] small farmers' markets from food that they’re growing at community gardens. This whole different approach to awareness of where our food comes from and what healthy eating looks like is incredibly important, not just for sustainable communities, but for healthy families. What’s the role of urban agriculture in Oakland’s food system? Oakland’s a leader in promoting and encouraging backyard agriculture. We have focused on the growing of fruits and vegetables. I think a lot of people have raised very legitimate concerns around raising animals for meat. Our regulations have been recognized as very progressive and it’s been exciting to see a lot of nonprofits and community groups really embrace awareness of food security and health as something that all communities have an absolute right too. Would you ever consider a tax break for urban farms like the one San Francisco has? I’m always open to creative ideas that are going to create a sustainable economy and make life healthier. It’s certainly something I’d be interested in learning more about. What are some other food issues you’re excited to work on? Oakland has a growing [number of] food manufacturing businesses and that’s a very promising part of our economy. We have one of the cleanest public water supplies in the country, which makes us very ideal for food manufacturing. Numi Tea is the largest fair trade tea company in the world and it’s headquartered here in Oakland. Ocho Candy, organic candies that are sold in Whole Foods, are a great success story. I’ll be honest: they initially had a lot of trepidation about the new minimum wage law. And now Dennis Ring is one of the biggest Oakland business boosters. He moved into a larger space, he’s expanded his business, he’s even employing formerly incarcerated workers and is loving it. It’s a really great example of a phenomenal Oakland food business. It’s sweet on so many levels. In your campaign, you specifically mentioned food trucks when you talked about making it easier to start a small business. That’s another place where Oakland’s food culture and arts culture kind of mesh together in a wonderful explosion of vitality. We are foodies but we also love culture, we love community, we love diversity and so by having this growing culture of local food vending and pods of food trucks, that becomes a social event, and it’s often tied with arts and culture. It’s a lot of what people talk about when they talk about Oakland as one of the hottest new tourist destinations in the country, but it’s also a fantastic way for entrepreneurs to start in the business. I worked for years in the Fruitvale neighborhood. Most of those brick and mortar restaurant owners started out with a truck. Another thing I’m very passionate about is the Kiva Zip lending model. These are interest free loans and we were the first city in the country to be a trustee on Kiva Zip. A lot of the businesses that we’ve endorsed for loans. Pop Art Bakery is just my favorite. I mean, oh my God, have you ever had one of their almond tassies? It’s a bite of heaven--with a lot of butter in it. They are just fantastic, a fantastic company that really benefited from a Kiva Zip loan. To end on a less serious note: where do you like to eat? I love Penrose. My husband and I have celebrated Valentine’s Day there for the last two years, partially because we’re not organized enough to make reservations. It just has phenomenal food, such a warm atmosphere and again, their food tastes better because I know that they’ve always paid a living wage to their workers. When my kids were babies, the first restaurant I ever took them out to was called Messob on Piedmont Ave. It’s Ethiopian food and it’s a great place to bring a baby because everyone eats with their fingers. I had this proud Oakland mother moment when my son’s class was studying bread--each child was supposed to bring in their favorite bread, and my son’s favorite bread was injera. My favorite ice cream is a place called Nieves Cinco de Mayo in the Fruitvale Public Market. They have wild flavors, like rose petal, and my favorite is cheese. Cheese ice cream. It’s like the stuffing of my mother-in-law’s cannoli, but made into ice cream. It’s out of this world.